In all my years of gigging I’ve been blessed to have seen some of the very best front men in pop and rock music. From the stadium filling icons of music such as Freddie Mercury, David Bowie and Mick Jagger to those equally as happy in a small intimate venue, a club or small theatre. And every single one of those performers have a skill that is very hard to achieve, a gift only given to a few. That being the ability to perform for a crowd of any size and perform to everyone there but at the same time to perform to just you, to make you feel like the only person at that gig. And that is when gigs become special. 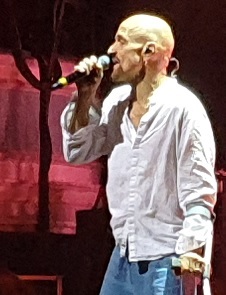 Add to those performers with that special talent, Tim Booth of James. A performer who always invests an energy into his gigs that is infectious. A frontman for whom it obviously means everything to him at that point in time. A singer who’d be as happy playing to 200,000 people as he would to 2 people in his local pub. A performer who is determined that you, and everyone with you, is going to have a special experience every time he picks up a microphone. On friday night in the Victoria Hall, Stoke on Trent, Tim and the band he fronts, had a couple of excuses for them not to hit the high standards we come to expect from them. With firstly Tim entering the stage on crutches after an accident earlier in the day, necessitating a swivel chair for him to perform from and a restructuring of the set list to accommodate, added to a crowd that seemed, from where we were, to disrespect the band in their initial acoustic set; even despite a brilliant musical putdown from guitarist/violinist Saul Davies, there was enough reason for the band to be below par. But below par isn’t what James do. And so, despite the odds stacking against them, the band still put out a performance that wowed. The full electric set rocked, the crowd were treated to a full range of sing and dance along hits mixed up with, perhaps for many of the crowd seemingly there for the Oh Sit Downs, an interesting blend of more obscure album tracks that appealed to those aficionados. And indeed, songs that brought together all in the room, culminating with a gospel choir like reaction from the crowd to ‘Many Faces’, Booth stood precariously in front of the adoring throng, arms out stretched, soaking in the moment. A moment of transcendental beauty ironically reminiscent of how people can be influenced; the irony being that here Tim and the band were using this to enforce a positive message when so often we see negativity from shamanic preachers of hate and intolerance. Of course James are much, much more than just a enigmatic and brilliant front man. The band are, as you’d expect from a group who’ve been performing since the early 1980’s, masters of their art. Tight as can be and with a back catalogue of hundreds of songs that they are all comfortable in performing yet with the edginess of being able to put themselves under pressure by mixing up and changing set lists almost seemingly at will. 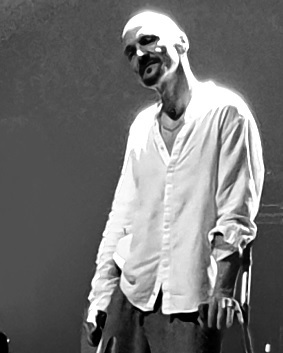 A James gig is always going to be a unique and enriching experience, one that will change from gig to gig, making them one of the most exciting and enriching live experiences a music fan can have. This Stoke gig, despite the issues out of their control which they took on and dealt with in awesome style, only confirms the status of James as a premier live band.